Want to live a healthier life? 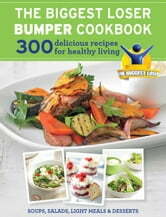 The Biggest Loser Bumper Cookbook makes healthy eating fresh, fun and simple. With 300 delicious recipes complete with a nutritional analysis of each, plus the latest advice on weight loss and eating right, healthy living has never been easier. Change your life for the better today!